Sydeny rock oysters, commonly found in coastal environments in Australia. Photo from Wikimedia Commons, by Stevage. Coastal waterways are some of the most productive natural systems on the planet. For example, estuaries and bays provide food and shelter that support important fisheries. However, many of the features that make estuaries so productive also make them prone to acidification. The organisms that live in estuaries must have mechanisms for dealing with acidification, and understanding how estuarine creatures adapt to low pH may help us predict ecosystem responses to ocean acidification. Transplanting oysters in a mangrove forest. Recently my colleagues and I published a paper looking at the impacts of estuarine acidification on oysters and the invertebrates that live in oyster reefs, using a case study in New South Wales, Australia. Many coastal areas in New South Wales are characterized by acid sulfate soils, which form sulfuric acid. We transplanted oysters in water of varying pH, and recorded how the oysters fared, as well as how the invertebrate community in the oyster reef changed. Overall, oyster-associated invertebrate communities that were exposed to acidiﬁcation were signiﬁcantly different from communities with low risk of exposure. The mussel Xenostrobus securis and the snail Bembicium auratum were signiﬁcantly less abundant in oysters that were exposed to acidiﬁcation, as compared with communities from areas with low risk of exposure. Both of these species are calcifiers, meaning they build shells out of calcium carbonate, which dissolves in low pH. The snail can migrate to avoid acidified water, which is a likely reason we observed fewer snails in acidified oyster reef. However, mussels do not migrate, and may instead experience higher mortality rates in low pH water. The response of these species to estuarine acidification suggests that calcifiers may be great indicator species that can help predict the impact of acidification on a community of organisms, even in an ecosystem that has been exposed to acidification for decades, such as the estuaries in New South Wales. Gini–Simpson species diversity index for oyster-associated epifaunal communities sourced from different chronic exposure regimes (moderate or low exposure to chronic acidiﬁcation, indicated by shading) and exposed to different episodic acidiﬁcation treatments (acidiﬁed and control). oyster mortality, suggesting that these communities are closely tied to oyster survival. Both of these species are immobile- therefore, oyster mortality may impact immobile organisms first, reducing their abundance. Relationship between abundance of oyster-associated invertebrates and oyster mortality. This study provides possible indicator species that could be used to look at acidiﬁcation in the Hastings Estuary and other coastal systems in NSW. Identifying indicator species that are sensitive to changes in pH may help ecosystem managers to relate changes in the environment to taxonomic diversity, and allow for a scientiﬁcally sound and logistically feasible means to see the impacts of management decisions. Finally, the results of this study suggest that the fate of this ecosystem is closely tied to that of its foundation species, the Sydney rock oyster. Because oysters and many other habitat-forming species such as seagrasses, corals, and kelp are at risk due to anthropogenic stressors, the degree to which habitat-forming species and their associated communities respond similarly or differently to the effects of environmental stressors is of concern. Resistance to acidiﬁcation in oyster-associated species in coastal NSW may depend on the ability of oysters to persist in the face of environmental ﬂuctuations or degradation. Does loss of habitat mean loss of function? Amount (area), loss rate, and value of several key coastal habitats, from Duarte et al. 2008. Increased human population near the coast and associated impacts on these environments are leading to worldwide loss of coastal habitat. These human-derived stressors have resulted in substantial loss of coastal habitats, including seagrass, salt marsh, mangrove, coral, and tropical forest. Losses occur due to land reclamation, development, excess sediment or nutrients finding their way into the water supply, overfishing, damage by boats and fishing gear, logging, competition from invasive species, some aquaculture, and climate change, including sea level rise and warming that makes some regions uninhabitable for certain habitat-forming species like coral. These habitats provide inherent value to humans, which can be quantified and is normally referred to as ecosystem services. Seagrasses, salt marsh, mangrove, and coral reefs all have high value in terms of ecosystem services- that is, they serve an important function for humanity. What do these services look like? One major service provided by coastal habitats includes protection from storms. Damages from storms like hurricane Katrina are exacerbated by the loss of salt marsh, which slow approaching waves and help mitigate flooding. Another valuable service complex habitats provide is protection of sensitive early life stages of a variety of commercially and recreationally important fish and shellfish species. These habitats act as a nursery for many species because the structural complexity they provide protects young fish from predators. 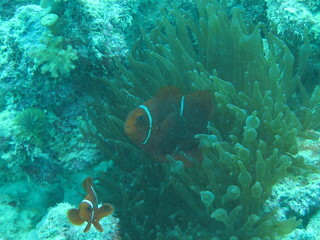 Some habitats, such as coral, function as the main driver of coastal tourism in many regions. This ecosystem service brings revenue to coastal communities. As corals and other coastal habitats are lost to stressors like climate change, so too are many other species that depend on them for structure. Thus habitat loss is generally also associated with loss in species diversity. The top threats to marine species include habitat loss (blue) and overexploitation, also known as overfishing (orange). From WWF, 2016. In fact, in the 2016 Living Planet Report predicts that the top threats for global biodiversity of vertebrates are habitat and overexploitation. This study pulls together data from more than 3,000 short-term and long-term monitoring project which together track the status of 14,152 populations of some 3,700 vertebrate species. Other major threats to diversity include pollution, invasive species, disease, and climate change. Overall it appears the cumulative effect of the stressors I’ve mentioned to this point has been a decline in species globally. There is a clear trend of declining diversity that appears to be accelerating. These are species that, while still present in the background, no longer contribute to their community the same way they once did. Collapsed taxa, or regional loss of species, between 1950 and 2005. Loss per year is shown in diamonds and cumulative species lost in triangles. The blue symbols represent annual estimates from data poor species, the red represent estimates from data rich species, and the black symbols are an average. From Worm et al. 2006. Here are some ecosystem services and risks that are associated with loss in diversity, on a regional scale. From Worm et al. 2006. The consequence of this is a loss of function, impairing the ocean’s ability to provide food, maintain water quality, and recover from disturbance. Loss in species diversity means decreased fisheries production, deceases in nursery habitat, and loss of filtration in coastal systems. The consequences of these lost ecosystem services include increases in events that harm people and their livelihoods, such as beach closures, harmful algae blooms, fish kills, fishery closures, low oxygen, floods, and invasive species. Overall, systems with high species diversity are more stable and provide more ecosystem services. Historical seagrass extent in the Chesapeake Bay (dark green) compared to range at present (light green). From Lefcheck et al. 2017. The Chesapeake Bay is no stranger to habitat loss. The dominant seagrass in Chesapeake Bay, eelgrass Zostera marina, plays an important role as nursery habitat for a variety of economically and ecologically important species in the Bay, including the blue crab. The abundance of seagrass has fluctuated over the last 100 years due to a disease outbreak in the 1930s, subsequent recovery until the 1960s, and dramatic declines post 1972, when tropical storm Agnes wiped out half of the population of eelgrass in the Bay. This was largely due to fresh water influx from heavy precipitation, and increased sediment loading from flooding, which buried beds. Eelgrass in Chesapeake Bay has never recovered from Agnes, and its range in the Bay has been drastically reduced. More recently, since 1991, eelgrass has declined 29%. This is largely due to poor water quality, from nutrient pollution and coastal development, which decreases water clarity and makes it hard for seagrass to photosynthesize, resulting in a 50% loss of deep water beds. The situation in shallow beds is exacerbated by rising temperatures, which is a source of stress for this species, which is at the southern end of its range in the Bay. Oyster reef habitat has also declined in the Chesapeake Bay drastically, with a 50-fold decrease since 1900. The decline began with the advent of more efficient fishing technology, indicating the decrease in oysters is due to overfishing and habitat loss, which go hand in hand for this species, since oysters live on other oysters. With the loss of oysters, a major source of shell was also lost, as oyster shell is a limited and non-renewable resource, and shells dissolve in seawater given enough time. This shell would have provided an important structure for attachment in a system otherwise characterized by soft sediments. So between seagrass loss and oyster reef decline, the Bay is experiencing substantial reduction in complex habitat. One group of species that may be impacted by habitat loss in Chesapeake Bay is bivalves. Bivalves serve many important roles in coastal systems like Chesapeake Bay. They are key prey resources for a variety of economically and ecologically important species, like blue crabs. Their capacity to filter feed contributes to the water quality of the Bay, as demonstrated in this photo of two tanks, one with oysters, which has clear water, and one without, which has murky water. Through filter feeding, and serving as a food resource for finfish, bivalves connect the food webs and nutrient cycles at the sea floor with those in the water column. And of course, bivalves support profitable fisheries in the Bay and in other coastal regions. In Chesapeake Bay, oysters and hard clams are the focus of aquaculture, and wild fisheries still exist for soft-shell clam and razor clams, which are mainly harvested as bait. Bivalves in Chesapeake Bay are highly diverse. Not all bivalves serve the same role. To illustrate this, perhaps it is best to look at two common species, soft-shell clam Mya arenaria, and Gemma gemma. Mya are several cm in shell height, and can be biomass dominants where they are locally abundant, while Gemma gemma max out at only a few mm, and are often hard to distinguish from grains of sand. How do we calculate the diversity of roles bivalves play in the Chesapeake Bay? We can caluculate something called functional diversity. Functional diversity goes further than quantifying number of species, and instead attempts to capture the roles that are filled by various species groups. Functional diversity operates on the premise that not all species are equally distinct. For instance, take these two photos. Both communities have just four rocky intertidal species. However, it may seem as though the community on the right is more diverse, because the animals represented are more different from each other than the animals on the left. In fact, the community on the left has three species of barnacle. While different barnacle species can look very different, they are likely all serving similar roles. The community on the right has species from different phyla, and even different kingdoms, that likely serve very different roles. Functional diversity metrics are based on functional traits: that is any measurable aspect of an organisms that reflects what it actually does, and how it interacts with its surroundings. Bivalves interact with their environments in a variety of different ways. Certain predators may or may not be able to eat them, depending on their defenses. Furthermore, bivalves themselves have different feeding modes. Thus, feeding mode is one of the traits that define how bivalves interact with their environment. Bivalve living position also serves as a functional trait. 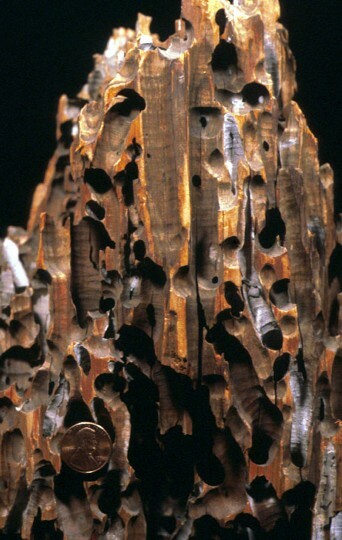 Bivalves that are on the sediment surface, such as the mussel, are easily encountered by predators, while deep-burrowing bivalves remain undetected. These three traits, based on a bivalve’s role in the food web, describe a bivalve’s function much better than taxonomic definition of species. Given four species (in the left box), how can we summarize functional diversity? The species can be placed on axis representing major traits, and the arrangement of species in space can be used to calculate an index of diversity based on pair-wise distances or a phenogram. From Petchey and Gaston 2006. Once functional traits are identified, there are a variety of ways to calculate functional diversity. For two continuous traits, such as shell thickness and burial depth, you can imagine mapping out each bivalve on those two axes, and calculating the distance between each. Some indices use this graph to calculate things like the maximum area between all species as a metric of functional diversity. Others will take the distances between species and create a matrix of pairwise distances like the one here, and calculate functional diversity as the average or sum of distances. Others still will create a phenogram showing the relationships between species according the traits. Functional diversity is then calculated as a function of number of individuals in each of these categories, A B C and D, using common diversity indices like the Simpson’s index. Functional richness can also be calculated as the number of functional groups in a sample or area. Phenogram of functional groupings for bivalves in Chesapeake Bay, based on the role of bivalves in the food web. From Glaspie and Seitz 2017. In a recent study published by myself and colleagues, we calculated functional diversity of bivalves in the Chesapeake Bay using the phenogram approach. We sorted all bivalve species into one of four groups, based on presence of an armored shell, feeding mode, and living position. These groups were deposit feeders (DF, meaning bivalves that extract nutrients from sediment), deep-burrowing and suspension (or filter) feeding bivalves (DBSF), thin-shelled and surface dwelling bivalves (TSSD), and armored bivalves (ARM). We then calculated diversity using these functional groupings, rather than individual species. We used this measure of functional diversity of explore how habitat is related to function in bivalves. We noticed that each unique habitat in the Chesapeake Bay supported a different bivalve functional group. Deposit feeding bivalves were associated with mud, possibly because this was a good food source for them. Armored bivalves were associated with oyster shell, likely because the hard shell material provides a surface for attachment for mussels, a common armored species in Chesapeake Bay. Finally, thin-shelled and surface-dwelling bivalves were strongly associated with seagrass habitats. It is likely the roots and blades of seagrass provide vulnerable species with needed protection from predators. It appears that all habitats play a roll in maximizing functional diversity in Chesapeake Bay. This means habitat loss may lead to the loss of entire functional groups of bivalves in the Bay, with consequences for ecosystem function. Bivalve functional group densities in different habitats in lower Chesapeake Bay. Different habitat types support different bivalve functional groups. From Glaspie and Seitz 2017. Report card for Chesapeake Bay seagrass. Green areas get a passing grade. In recent years, seagrass is doing well in the lower Bay. From Orth et al. 2017. It’s not all bad news- recently seagrass in particular appears to be recovering in the coastal bays of Virginia and in some locations in Chesapeake Bay. This may bode well for ecosystem function in the Chesapeake Bay. However, out understanding of habitat and ecosystem function means persistent action to maintain healthy growth of seagrass, and maintenance of all habitats in the Bay, is necessary to maintain the natural resources for future generations. Duarte, C.M., Dennison, W.C., Orth, R.J.W., and Carruthers, T.J.B. 2008. The charisma of coastal ecosystems: Addressing the imbalance. Estuaries and Coasts 31:233-238. Lefcheck, J.S., Wilcox, D.J., Murphy, R.R., Marion, S.R., and Orth, R.J. 2017. Multiple stressors threaten the imperiled coastal foundation species eelgrass (Zostera marina) in Chesapeake Bay, USA. Global Change Biology. 23(9):3474-3483. Orth, R.J., Denison, W.C., Lefcheck, J.S., Gurbisz, C., Hannam, M., Keisman, J., Landry, J.B., Moore, K.A., Murphy, R.R., Patrick, C.J., Testa, J., Weller, D.E., and Wilcox, D.J. 2017. Submersed aquatic vegetation in Chesapeake Bay: Sentinel species in a changing world. BioScience 67(8):698-712. Petchey, O.L. and Gaston, K.L. 2006. Functional diversity: Back to basics and looking forward. Ecology Letters 9:741-758. Worm, B., Barbier, E.B., Beaumont, N., Duffy, J.E., Folke, C., Halpern, B.S., Jackson, J.B.C., Lotze, H.K., Micheli, F., Palumbi, S.R., Sala, E., Selkoe, K.A., Stchowicz, J.J., and Watson, R. 2006. Impacts of biodiversity loss on ocean ecosystem services. Science 314:787-790. WWF. 2016. Living Planet Report 2016. Risk and resilience in a new era. Welcome to my acidification laboratory! CO2 bubbling into an experimental tank to acidify the seawater. Today a paper on acidification in blue crabs and soft-shell clams, written by myself, my intern, and my PhD advisor, was published, so I thought I’d celebrate by sharing the lab setup we used. We acidified seawater by bubbling CO2 into tanks. This mimics the process of ocean acidification, which is caused by excess CO2 in the atmosphere (see my blog post about ocean acidification). Solenoid valve used to keep pH constant and low. We added only enough CO2 to maintain the pH of the water at 7.2, which is about 4 times more acidic than today’s pH in the York River (a tributary of Chesapeake Bay). pH was controlled using a pH meter paired with a solenoid valve. This valve only opened to let CO2 in the tank when pH increased above 7.2. Juvenile soft-shell clams were either acidified or held in non-acidified tanks (as a control) for 30 days. 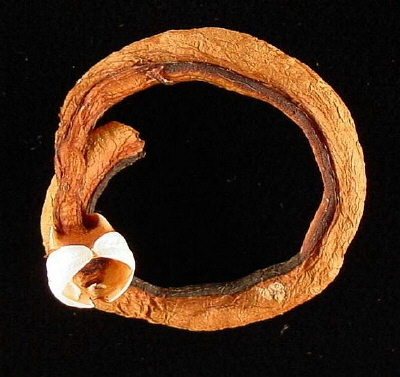 After this period of time, acidified clams had lighter shells than clams held under the control. This is likely because it is harder to build shell in acidified water, which tends to dissolved calcified matter like shell material. After 30 days, clams were placed in sand and we tested their ability to avoid detection by predators by moving a probe slowly towards the clam, and seeing when the clam would exhibit “hiding” behavior. The behavior we were looking for was retraction of the siphon, which is the fleshy opening at the top of the clam that draws in water for feeding and respiration. Acidified clams allowed the probe (simulating the approach of a predator) to get closer before hiding than non-acidified clams. This may indicate that soft-shell clams will be less successful avoiding predation when they are exposed to acidification. A buried clam (left) responds to a moving probe (right) meant to simulate an approaching predator. Photo courtesy of K. Longmire. A blue crab waiting for a feeding trial. Photo courtesy of K. Longmire. Finally, clams were exposed to real predation by blue crabs. Crabs were held in acidified or control tanks for 48 h before feeding trials to acclimate them to reduced pH conditions. Then they were allowed to feed on 4 soft-shell clams (which were allowed to burrow in sand) for 48 hours. After the trial was over, we searched for any remaining clams and calculated clam mortality. Feeding trial setup in the seawater laboratory. In normal conditions, if a crab detects there is food available, it is typical for that crab to continue searching until all clams are found. Alternatively, another example of normal behavior is for crabs to fail to detect any prey, forego foraging entirely, and laze about for 48 hours, leaving all clams alive. What is not normal is for a crab to consume a portion of clams, and then stop searching. This abnormal behavior never happened for non-acidified crabs, but over half of the acidified crabs ate only a portion of the prey. Furthermore, crabs found at least one clam in all of the acidified trials, possibly because clams are not that good at hiding when they are in acidified water. Monitoring blue crab behavior using cameras. search time; and (3) handling time (h), which is the total cumulative time spent manipulating and/or eating a bivalve, divided by the number of encounters. rates, which also supports the conclusion that acidified clams are bad at hiding. However, acidified crabs also had lower search time, which means they spent less time foraging, even though they were able to detect prey. Handling time, encounter rate, and search time of clue crabs exposed to acidification (acidified) or held under a control (ambient). From Glaspie et al. 2017.
make viable predictions and take conservation actions that may preserve these species. The Great Barrier Reef is arguably the largest living organism in the world. Arguably, because it is actually made up of billions of tiny organisms, that are themselves part animal, part plant, and part mineral. Coral polyps, the base unit of a coral reef, are colonial animals that look like teeny tiny anemones. Inside their skin they have algae that help them by making some extra food from sunlight. These algae are called xoozanthellae. The coral also secret a hard calcium carbonate skeleton, which (for hard corals at least) forms the base of the colony and helps the coral grow. Over thousands of year (8,000 to be exact) these tiny creatures have built a structure that can be seen from space. I have dreamed of seeing the reef ever since I was a child, and am so excited I got to dive on the reef as part of the first few weeks of my 10-week stay in Australia. After all of the time I have spent sitting in marine biology classes, I am well aware of all of the problems facing the Great Barrier Reef, including disease, pollution, and climate change, which causes the corals to lose their friendly algae, causing the corals to turn white, or “bleach”. However, after talking to some scientists at the Australian Institute of Marine Science this week, I have learned about another threat to coral reefs- starfish. A particular species of starfish, the crown of thorns starfish, is a very efficient predator of coral. In addition, it has a rather nasty habit of popping up every couple of decades in epidemic proportions. Nobody quite knows why, but it seems every 10 or so years the starfish show signs of increasing in numbers, and then are found everywhere on the reef, consuming coral and sending the Australian tourism business into episodes of head-hanging and hand-wringing anxiety. Crown of thorns starfish lying in wait. They like to feed mainly at night. Like vampires. As I mentioned, crown of thorns starfish are predators of coral. In fact, they are extremely effective and efficient predators of coral, perhaps even the perfect predator. Adult crown of thorns starfish start producing eggs when coral are getting ready to reproduce. Just as the corals are storing away extra nutrition for spawning, crown of thorns starfish come through and munch away at the extra-fat coral polyps, siphoning the food directly into their eggs. Then they release their eggs at the perfect time so that when the eggs hatch, the coral is spawning, releasing eggs and sperm into the water column that will serve as a buffet for the young crown of thorns starfish, which spend the first few days of their lives as plankton, drifting in the water and feeding on small things like coral eggs. Then when the crown of thorns starfish are adults, they continue to mow down the coral at a rate of 6 square meters per year. This doesn’t seem like much, but since they have millions of baby starfish each year, very few natural predators, and can live 6-8 years, they can consume quite a bit of coral. It is clear that this creature has evolved to become a very effective predator of coral, and it is understandable that people who depend on the reef for their livelihood are concerned about an outbreak of crown of thorns starfish. 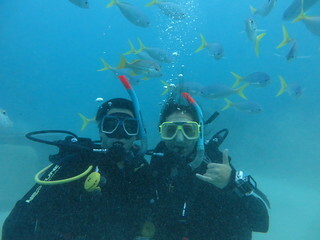 Cassie and Cal being reef tourists. What can be done? Some scientists are focusing on understanding what causes the starfish to reach epidemic proportions, so they can reverse or at least prevent outbreaks. One leading hypothesis is that pollution from land, especially extra nutrients, causes more young crown of thorns starfish to survive to adulthood, because there is more food for them. 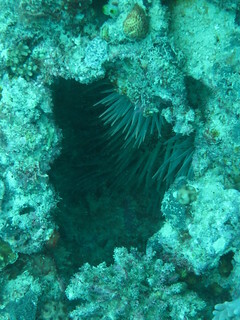 However, other scientists believe that crown of thorns outbreaks are simply natural phenonmenon that are caused by a slight change in water flow around the reef, which keeps more young starfish on the reef, instead of flushing them out to sea. Other researchers are focusing on an immediate fix for the crown of thorns starfish problem. They focus on developing a way to kill crown of thorns on the reef, and they have developed a lethal injection that will kill the starfish, but this method is expensive and would require a lot of man power. Other researchers are looking for deterrants or even attractants so we can keep starfish out of some areas or trap and remove them in large numbers. The trouble is that they will have to find an attractant/deterrant that works only for the crown of thorns, and not on any other starfish, because we are still concerned about keeping the other starfish that do not destroy the reefs healthy. If this is likely a natural phenomenon, why should we care? While reefs may be able to bounce back from an outbreak of crown of thorns starfish, it is also just as likely that the other problems that plague the reef, including pollution, climate change, and other natural phenomena like storm events, may make it too difficult for coral to repopulate the reef. Certain coral species, and even certain reefs, may be lost. So how likely is it that crown of thorns starfish will eat the Great Barrier Reef? The best coral reef scientists believe that the crown of thorns starfish numbers are increasing, and the last time this happened there was a severe outbreak within a few years, so many people are very concerned. I, for one, am glad I made it out to see the reef this year, and not a couple of years from now. The reefscape may look very different in just a few short years. Front view of a longhorn cowfish. Photo courtesy of I, Drow male via Wikimedia Commons. Welcome to the Cowfish Blog! You may have heard of a cowfish before, or maybe not, but two things are certain- cowfish are REAL and they look strange compared to most fish. I figured I would introduce my mascot in this first post, and in doing so tell you a little bit about this blog, and science in general. So first, let me introduce my guest of honor, the cowfish. You may notice a couple of things about the cowfish that stand out as strange. It is shaped like a box. That boxy shape is made of bone, which makes the cowfish much larger than would be necessary to simply contain its innards. This makes the cowfish, which tops out at about 20 inches in length, one of the largest fish around on the coral reefs, where it makes its home. That is excluding the sharks. And the groupers. In any case, it is large, which means it is noticeable if you go snorkeling in the Indopacific, especially because it is bright yellow. Its coloration makes it stand out to tourists, and also to predators. The cowfish doesn’t have to worry about standing out to predators because it has a couple of ways to defend itself. First, it has horns. These horns make it too large to fit in the mouths of most fish, which means only very large predators can hope to make a meal of a cowfish. Second, it is toxic. When a cowfish feels threatened it secrets poison from its skin, and this poison is very dangerous to other fish. This means that a shark that bites down on a cowfish might seriously regret the meal. Cowfish poisoning will first cause disorientation and erratic movements, then coma, then death. It is even toxic to mammals, though it takes a lot of toxin to affect humans. Cowfish toxin can have an indirect effect on humans that keep fish in aquaria, and have a sick cowfish kill an entire tank of fish in a night. Speaking from experience, of course. I think most people would agree that a cowfish looks like a very slow swimmer. In fact, cowfish are fairly fast swimmers that can swim long distances using little energy and with great stability. They swim using movements from their fins only, since they can’t bend their bodies. At slow speeds the tail is used for steering, like a rudder. Their body shape can automatically correct any tips and dips that happen when waves sweep over the coral reefs on which they live. That is because all of the edges of a cowfish’s boxy frame stick out in a flat plate similar to the keel of a boat. Boat keels are designed to keep the ship stable in the water and to help prevent it from tipping over, and a cowfish keel works the same way. In addition to providing stability, all of the protrusions on the cowfish’s body interrupt water flow from pretty much any direction and push the water away from the cowfish, making for a smooth ride. This is similar to what happens to a delta wing aircraft in flight. Delta wing aircraft are designed for maneuverability, and so, it seems, are cowfish. Cowfish can turn on a dime and swim upside down, which are adaptations that allow them to explore all of the hiding places in a coral reef. As I mentioned, cowfish are also extremely enregy efficient swimmers. Boxfish (a relative of the cowfish) use about as much energy while swimming as a sockeye salmon, a fish built for traveling long distances. In fact, cowfish swimming is more efficient (at pretty much all speeds) than the smallmouth buffalo fish, a carp that lives in the Mississippi River and has a much more typical fish shape. Mercedes-Benz Bionic. Photo by NatiSythen via Wikimedia Commons. The cowfish body design is so efficient that engineers often turn to the cowfish for inspiration. One application of the cowfish body shape could be a more energy-efficient design for a stable underwater vehicle. DaimlerChrysler AG actually designed a concept car based on the body shape of the cowfish and its relatives. This car, called the Mercedes-Benz Bionic, was introduced as a highly energy-efficient vehicle in 2005. It can go from 0-60 mph in 8 seconds, which is 0.1 seconds LESS than the Jaguar S Type 2.7d V6 Sport introduced in 2004. Clearly there is a lot that can be learned from the cowfish. Illustrations of cowfish by Ernst Haeckel, 1904. One thing we often don’t think about (or maybe you do, in which case you MAY be a biologist) is how did the cowfish get this way? Over evolutionary time (we are talking hundreds of millions of years) fish are exposed to different pressures that they must be able to survive in order to persist as a species. These include predators, finding food, finding mates, and a variety of other things. So which of these pressures caused the cowfish to look the way it does, and why did it respond to these pressures differently from every other fish? Certainly other fish can avoid predators by hiding or using camouflage, and it seems like the cowfish sure wastes a lot of energy developing its bony armor and toxins when it could have just covered itself in camo. There are plenty of other fish on the reef that are masters of maneuverability, such as the wrasse, and these fish don’t have to build up a boxy shape to accomplish amazing feats of hydrodynamics. So what caused the cowfish’s ancestors to develop its unique shape, horns, and toxins? Perhaps we will never know, but we can imagine that the route from a normal fish-shape to the shape of my most recent Amazon delivery was probably not a direct one. If it was, we would likely see it a lot more often in the animal world. I, for one, am glad that the cowfish’s ancestors took such a circuitous route to become the unique species it is today, not only because I appreciate cowfish for their adorable appearance, but also because I look forward to the day when I can travel underwater in a submarine built like a cowfish. Which may or may not be yellow. But I really hope it is yellow. This leads me to the reason for naming my blog after the cowfish. The cowfish embodies many of the reasons why I love science. Science is weird and full of questions. You can spend your entire life as a scientist asking and attempting to answer questions. However the answers, when you do get them, are usually not direct, much like the evolution of the cowfish. As a result the quest for answers is a journey that leads the scientist to strange and interesting places. The end is something you probably never expected, but it is also immensely more interesting than you expected. I love that about science, and I love that about the cowfish. So stay tuned for some more not-so-streamlined science- my experiences as a marine scientist, and interesting tidbits about science and the natural world. Bartol, I.K., M.S. Gordon, M. Gharib, J.R. Hove, P.W. Webb, and D. Weihs. 2002. Flow patterns around the carapaces of rigid-bodied, multi-propulsor boxfishes (Teleostei: Ostraciidae). Integrative and Comparative Biology 42:971-980. Thomson, D.A. 1964. Osctacitoxin: An ichthyotoxic stress secretion of the boxfish, Ostracion lentiginosus. Science 146(3641):244-245. Gordon, M.S., J.R. Hove, P.W. Webb, and D. Weihs. 2000. Boxfishes as unusually well-controlled autonomous underwater vehicles. Physiological and Biochemical Zoology 73(6):663-671. Bartol, I.K., M. Gharib, P.W. Webb, D. Weihs, and M.S. Gordon. 2005. Body-induced vertical flows: A common mechanism for self-corrective trimming control in boxfishes. The Journal of Experimental Biology 208:327-344.